Desktop full size football helmet acrylic case with black base and gold risers. handcrafted and polished to a high luster. Features a full mirrored back. but without the gold risers. This case has a black acrylic base. It gives the case a more traditional look. Features a full mirrored back. Dimensions are 14 1/2 x 11 x 11. Desktop full size football acrylic case with black base and gold risers. 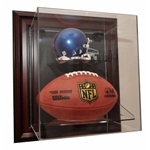 Football acrylic display case with mirror back and a wood base with a walnut, cherry, oak, or black finish. 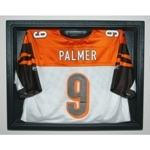 high quality investment in the protection of your memorabilia collection. Price includes 1 free nameplate. Interior dimensions are 12"L x 8"W x 8"H.
Football acrylic case with black and mirrored base and custom ball pylon stand. 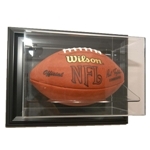 Wall mountable football vertical acrylic case with wood frame. Wall mountable football acrylic case with wood frame. with a 3/8" thick clear acrylic bottom and a 1/4" thick clear acrylic ball shelf/stand. This case holds 1 regulation size NFL or NCAA football. Mini helmet and 8x10 photo acrylic display case with gold risers. Price includes 1 free nameplate. If no nameplate is wanted, simply leave that field blank. 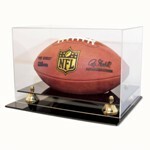 Full size football acrylic display case with gold risers and a custom lid to accommodate an 8x10 photo. Price includes 1 free nameplate. If no nameplate is wanted, simply leave that field blank. Desktop baseball cap/hat acrylic case with black base and gold risers. Designed to hold 1 full size cap with the back folded in. and hold it up off of the base. Features a double gold riser black base and mirrored back panel. Also features optically clear, richly beveled UV protected acrylic.